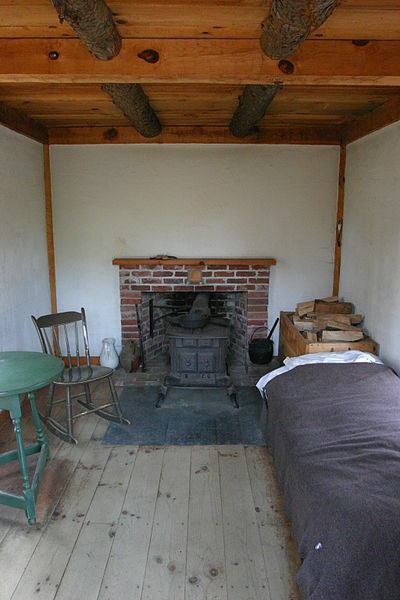 “I went to the woods to live deliberately…” That’s Henry David Thoreau in the opening pages of Walden, the little book he wrote after two years of living in the cabin he built on the shores of Walden Pond, just two miles from the town of Concord where Nathaniel Hawthorne briefly lived. Where Bronson Alcott lived too, with his high-minded ways and raised up the dark-eyed talented Louisa. Where, most of all in my mind anyway, Ralph Waldo Emerson lived, with his big nose and his kind face; Emerson, who helped support his far younger friend Henry, lending him the use of that patch of land by the pond, and even taking him into his house to live with his family and tutor his children..
Around these parts we all know Walden Pond over there in Concord. I know it’s just ten miles from my house. I know it was formed by the retreating glacier a mere 10 or 12 thousand years ago. I know, or learned much later, it’s the place where my teen children went night-swimming with their pals behind all our backs and all in defiance of many laws. I have read Thoreau’s Walden so many times that the things he says there and facts of his life come constantly into my mind, and I wonder always how he managed after losing his brother to John to lockjaw. 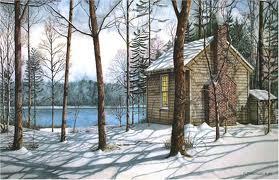 It was about their trip down the Concord and Merrimack rivers that he was trying to write when he lived in that little cabin. I always assumed he was trying to bring his brother close again in the writing, as I have been trying to do with my sister Nan who, much to my dismay, moved to faraway Florida in the late ’70s and has been there ever since. This week my man and I are away from our house that lies so close to Concord. Life chugs along without us there however, since four adults and an infant are living with us this summer – which means that I the worrier am free from worry over who will bring in the mail and papers. Free from worry over what lights we’ll leave on to fool those robbers in their cartoon robber-masks who we somehow picture making their nightly rounds, trying doors, as faithful as lamplighters of old …. This week I’m free from all such worry. Free to hike and swim and read Walden in these soft New Hampshire hills, where we mean to spend our time. Food for thought all right. I wonder: should it be crisp broccoli, rich butternut squash and good dark beans for our supper tonight? blend…. I like that ! Since 1987 no raw material of bones has entered my system, except fish now and then. I’m pretty strong for 71 – hit the golf ball almost as far as I did at 18. Would I not have osteopenia if meat had been in my diet? No way to know. I don’t do Foxomex or Boniva. 1500 mg of calcium (750 of magnesium so as to avoid constipation from the calcium) and 400 IU Vit D. Never had a broken bone. Thoreau would have been fine without hunting flesh. This is fascinating to me. AND if I recall you’re also a tap-dancin’ fool! I’ll say one thing, you sure make 71 look good!